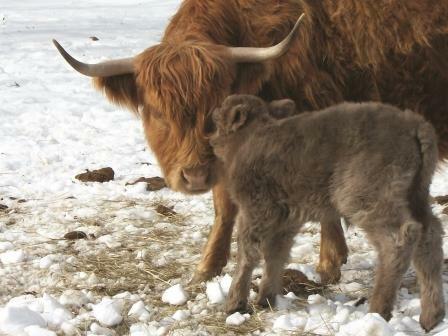 ​Highland cattle are known among other things for their calm nature and easy going disposition. That being said, there are some techniques and "rules of thumb" that people will learn as they go through the years with their own herds of cattle. These tips are an attempt to summarize what others have learned and pass it on. Highlands are social animals. They know their herd mates and how to interact with them. Become a part of that herd. If possible, walk out among them several times a week, even if only for a few minutes. Let them get to know who you are. The more familiar they are with you, the easier it will be when you need to move or handle them. This time spent with them is also a good time to check for problems such as injuries, or illness.The more familiar you are with them, the easier it is to recognize when something isn't normal with an individual and to investigate whether there is a need for treatment. Like people, each individual in the herd has their own personality and mannerisms. Knowing these mannerisms can make it easier to identify potential health problems. Fast movement indicates to the herd that something is wrong. Even the calmest animal will run the other way if you go running down to the fence or run up to the herd. Take your time when approaching them and let them know that you are there with both verbal and visual cues. If you want to scratch or comb them, reach for their hind quarters or their back first and start there. Reaching for the head first may cause them to shy away because they don't know what your intentions are yet. Yes, cattle have a comfort zone. Some will allow you to walk right up to them, others will only let you within several feet of them. Respecting that space can make it much easier when working with your herd. If you are moving them between pastures or trying to work them down to the barn, stay just outside of that space, opposite the direction you want to move them in. They will tend to calmly walk in the direction that you want them to go. If you violate their space, they may tend to want to run from you, and not necessarily where you want them to go. You will find that cattle don't do anything fast (except maybe when there's a feed bucket in sight). If you are going to handle your cattle for any reason, don't get in a hurry. Rounding them up with an ATV may seem like an efficient way to get the job done, but more likely will get them agitated before you get them where you are going (see #2 above). If you accept the fact that it will take a little longer to get a job done if you coax them rather than drive them and allow time accordingly, it will result in much less stress on them and on you. We're not necessarily talking a lot of money here. But we are working with large animals with horns, and when performing veterinary procedures like vaccinations, some means of restraint is desirable. It is desirable to insure your safety and that of the animal. If a commercial alley is out of your budget, again, you can make one out of cattle handling panels. Even a box stall in the barn can serve as a chute, if necessary. A standard tube gate can be used to squeeze the animal up against one wall of the stall. The point here is that you should have some means of working with your animals safely and efficiently. Sooner or later there may come a time when an animal is injured or having difficulty calving, and it will be necessary to work with that animal. You will also find that your veterinarian is much more willing to come to your farm if he or she feels safe when working around your cattle. Keeping a few cattle panels on hand is a good idea. Sometimes a temporary pen can be handy for corralling an animal.These panels can be used in a variety of situations where you may want to confine an animal or guide it through an area. As mentioned above, cattle are very social animals. They have their own social structure and “pecking order”. When you introduce a new animal to the herd, there will be a certain amount of bellering, pushing, and shoving. This is normal and will stop once it has been established who is higher on the social ladder. You will even see this among animals from the same herd if you remove one for a few days and then return it to the herd. They just need to re-establish who the dominant animal is. In addition, animals may move up the social ladder as they mature, grow in size, or gain increased confidence. 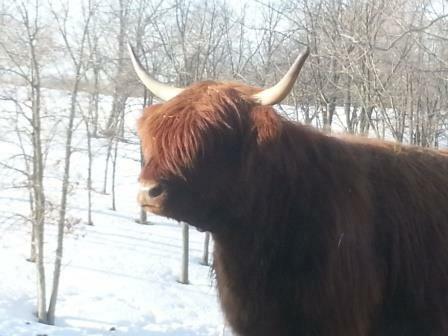 Highlands do not require a shelter such as a shed or run-in for the winter. However, some sort of windbreak should be provided. With their thick wintercoat, you'll see them walking around with frost or snow on their backs. They really enjoy winter weather. However, very cold weather and the occasional high winds that can accompany it do present the need for the wind-break. 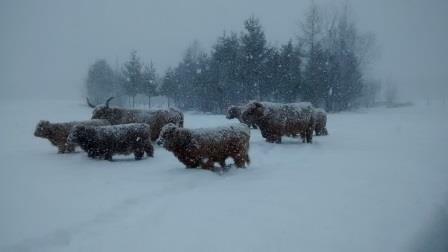 If cows will be calving in winter, then some form of shelter might be desirable until the new calf is dried off, on its feet, and eating on its own. There are times when we all have a question about something. It could be about calving, behavior, handling, etc. Your veterinarian can be a good source of information. Another place to turn is one of the regional cattle associations. A list of members in the North Central Highland Association is available HERE. Many members are more than happy to answer questions or just discuss Highlands in general. If you are unsure about who to contact, feel free to contact one of the people on the Board of Directors, and they can recommend someone in your area to contact. Board members are listed HERE. 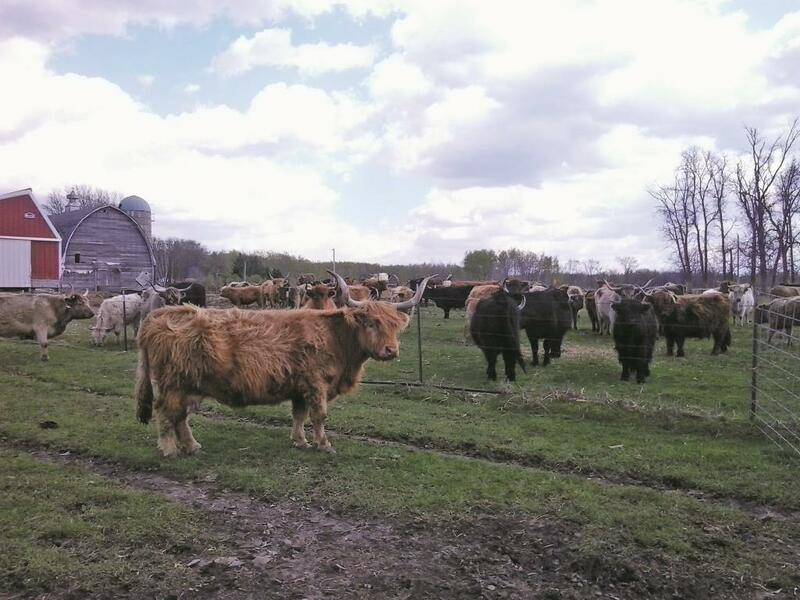 The American Highland Cattle Association is also a good place to look for contacts from your region, if you don't happen to be from the upper Midwest. You can find the AHCA members in your area HERE.